I’ve slowly started to come around to Mexican food. It’s not that I don’t like it, because I do (I mean, who doesn’t love a culture of food that makes it acceptable to devour a big bowl of melted cheese!? ), however I’ve always stuck with plain tacos. Though, when getting ready to have my sweet baby boy I wanted to prepare a few meals the last few months that I could freeze for when I knew I’d be too busy cuddling to cook. I did make up some precooked Taco meat, but I also knew I wanted some more substantial foods as well. With Cinco de Mayo around the corner last year I decided to “be adventurous” and step outside of my Mexican comfort realm. 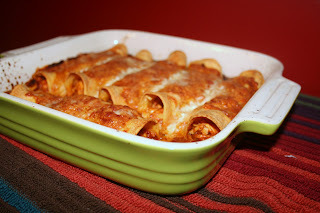 While looking through some of my favorite blogs, and poking around on FoodGawker, I found these delicious looking chicken enchiladas. What I loved about the recipe is that they seemed like an easy way to recreate a Mexican restaurant staple. Easy, yes – quick, no! I am glad I didn’t try making them for the first time AFTER Tyler was born, because I made them in them in the middle of the week not paying attention to time! They are time consuming, but oh so well worth it! I have made them since he’s been born, but I now know that they’re best made on a weekend; at least for my schedule with a demanding 9-month old! I’ve also since that first time made with precooked chicken, and it’s come out just as delicious! As I mentioned, yes, these are time consuming but totally worth it. Make them some weekend and thank me shortly thereafter! Directions: Adjust an oven rack to the middle position and heat the oven to 425 degrees. Combine the onion, oil, and 1/2 teaspoon salt in a large saucepan. Cover and cook over medium-low heat, stirring often, until the onions have softened, 8 to 10 minutes. Stir in the garlic, chili powder, cumin, and sugar, and cook until fragrant, about 30 seconds. Stir in the tomato sauce and water, bring to a simmer, and cook until slightly thickened, about 5 minutes. Nestle the chicken into the sauce. Reduce the heat to low, cover, and cook until the chicken is no longer pink in the center, and the thickest part registers 160 degrees on an instant-read thermometer, 10 to 12 minutes. Transfer the chicken to a plate; set aside to cool. Strain the sauce through a medium-mesh strainer into a medium bowl, pressing on the onions to extract as much liquid as possible. Place onion mixture in a large bowl and set aside. Season the sauce with salt and pepper to taste. Once the chicken is cool enough to handle, shred into bite-sized pieces. Add to the bowl along with the onion mixture. Add in 1/4 cup enchilada sauce, 1 cup cheddar cheese, the chopped jalapeños, and the cilantro. Toss to combine. Stack the tortillas on a microwave-safe plate, cover with plastic wrap, and microwave on high until warm and pliable, 40 to 60 seconds. Spread the warm tortillas out over a clean work surface. Place 1/3 cup of the chicken mixture evenly down the center of each tortilla. Tightly roll each tortilla around the filling and lay them seam-side down in a 13 by 9-inch baking dish. Reduce oven temperature to 400. Remove enchiladas from oven and pour remaining sauce over to coat them thoroughly. Sprinkle the remaining 1 cup cheddar down the center of the enchiladas. Cover the baking dish with foil and bake until the enchiladas are heated through, 20 to 25 minutes. Remove the foil and continue to bake until the cheese browns, about 5 minutes longer. Remove from oven and let stand for 10 minutes before serving.